Last edited by Chad; 10-15-18 at 06:54 PM. Has anyone else noticed that the disucssion thread seems to be broken. I tried to PM and email Chad but got errors there too. All of dvdtalk was hard down or buggy for most of the last 10 hours. Seems close to normal finally just now. Who drives out to the middle of nowhere to see a stranger about car repair? A rabid dog is the least of what could go wrong in that scenario. 'Now a days' she would have had her smart phone out and been saved within an hour (or perhaps had a gun); technology is ruining out ability to tell tales. Cujo seems like early template for later movies where people are just stuck - while those can be atmospheric (like the one on the ski lift, or the one where in an underwater shark cage) it's hard to pace those to be tense. I think future films that 'out-Cujo'ed' Cujo with pacing and atmosphere; not Dee Wallace who gives a top notch performance. Cujo has some great ideas that seem to fall just short in execution, likely suffering in transition from book to screen. I'm a fan of allegory movies that are filled with social commentary and Cujo flirts with that such as with the unfaithful wife and that most of it's 'horrors' are domestic rather than in the dog for much of it's runtime. The monster in the closet scene brilliantly set up the idea that horrors are mundane not supernatural. The 'Joe Camper' bits are so extreme they're cartoonish and not impactful, if those were toned done some it might have said more and the shifts in tone from brutal family dynamics to hillbilly stereotypes and then to canine terror sometimes seem jarring. 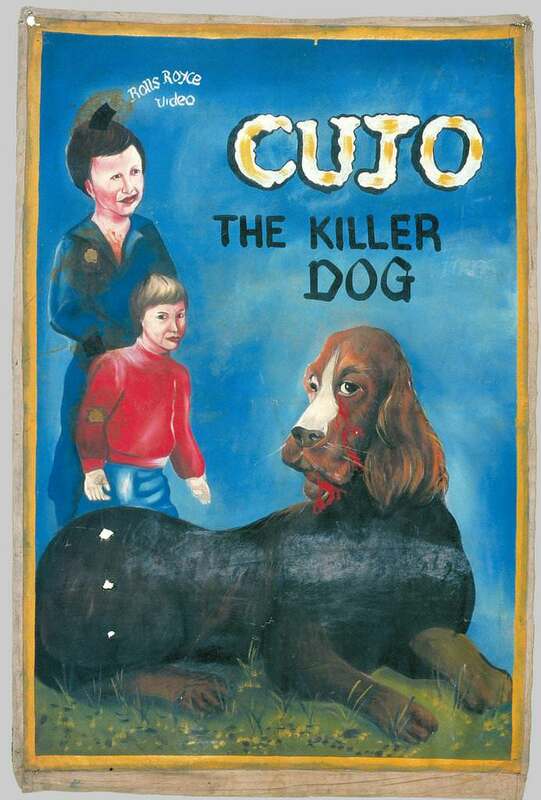 I’m not sure I feel great with a lot of the readings that might come from looking at Cujo are primarily a family metaphor in the second half. Men are too busy with work to truly protect their families? Women are isolated themselves (through infidelity) now must shelter her son on her own although she is ill equipped in isolation? I’m not sure if that’s what is being said, or that I buy those ideas; probably overlooking something thematic. Cujo is a great 'what would you do' scenario. Last edited by Undeadcow; 10-11-18 at 11:34 AM. Geeze, I haven't seen this move since I was a short lad. Really looking forward to watching this tonight. Re-watching Cujo was surreal because it has also been a very long time since I saw it; Cujo looks great in high definition. This was practically a first time viewing for me since it's been so long. This was my pick so it's no surprise that I loved rewatching this. I agree that it looks great in high definition, I probably haven't seen this in 30+ years and I felt like it really held up well. I have always loved Dee Wallace and it was great to see Danny Pintauro before he went on to Who's the Boss, which was a show that I loved. I never read the book (once I saw the movie I felt like the book would be a disappointment) but I thought this was very well directed. You could tell that Dee Wallace's character was having an affair immediately and I feel that it was obvious that Joe Camber's (Ed Lauter) wife was definitely leaving her husband when she left but in both cases it was very good acting that was much more subtle then you normally get in today's movies. Cujo's makeup was awesome and I really felt that he could tear that car apart. I feel very bad that this was not available for streaming, my excitement for the movie overshadowed the research I should have done in that department. I do hope that a lot of people are still able to watch this and that they enjoy it. nowhere near as scary as I remember it being. orlmac -- I loved it. I haven't seen it since the 80's either, and I've been wanting to rewatch it for a long time. When it was on the subset list, I bought the Olive blu ray from ebay and I'm so glad I did. It looked amazing. So I'm glad you picked it. I agree that the dog make-up was incredible. And the acting too. He really looked rabid. I thought it held up marvelously. Great vintage horror. 8/10 for me. As with most of you, I have not seen this in years. I think it holds up well. The story is effective and the build up to the last 40 minutes worked. Only thing is the kid. Like most kids in films, I just found him so damn annoying I started rooting for the dog. I may be the only person in this year's Challenge who had never seen this movie before tonight. I had heard so much about it that I didn't really see any need to watch it. I'm glad that I've remedied that false assumption. I enjoyed it quite a bit. The freeze-frame ending seemed a little rushed, but other than that, I thought that it was well-made and well-acted, especially by the dogs. I love the little nod to this film that director Lewis Teague put in Cat's Eye. Oh man, poor Cujo! That poor dog was looking really bad by the end. It's been well over 30 years since I've seen this one, and it really does feel like a first time view. This is probably one of my favorites for the challenge, as it's got some truly terrifying scenes. I feel it probably needed a few more minutes to flesh out the other story lines, but I still felt it was really effective. I kept on switching on the commentary and learned that they had 3 options for Cujo. They had a real St. Bernard because you need a realistic dog to do the dog stuff. They also had a dude dressed in a dog suit with a large dog head for close-ups. Due to his very happy, laid back disposition, they also had a Labrador stuffed in a dog suit. You can see the dressed up lab when the little boy meets Cujo in the fog, and the dog is clumsily walking out of the scene into the fog. I may be the only person in this year's Challenge who had never seen this movie before tonight. First time view for me too but I do remember reading about it in the '80s. I remember that too, another dog in a suit so it would appear vicious on screen. The effect works for the most part -- probably would be a lot of CGI today.